Of the total installed capacity of 802 MW in the Integrated Nepal Power System (INPS), the Kulekhani Hydropower (92 MW) is the only storage hydropower plant capable of seasonal regulation. The existing peaking capacity is insufficient to meet the peaking demand in the system. This is shown by the severe capacity and energy shortage during the dry season. Most of the plants that are being implemented or planned are Run of the River (ROR) plants. With the addition of more ROR plants, there will be increasing surplus of energy during the wet season and deficit in the dry season. The seasonal fluctuation of water discharge in the rivers of Nepal is the main cause for this imbalance. The dry season flow becomes almost one tenth of flows in the wet season. As a result, INPS will continue to be as sub-optimal system in the absence of peaking plants, resulting in the spilling of water during the wet season at ROR plants and capacity deficit during the dry season. A storage project of sufficient capacity is the only remedy for such a situation. Budhigandaki Hydropower Project, being centrally located from the main load centers (Kathmandu, Pokhara and Chitwan) and having large storage capacity is capable to address the national peak electricity demand and energy deficit during the dry season especially from Mansir to Baishak. Government of Nepal has, thus, decided to build it as soon as possible as a "National Pride Project". With a total area of 5005 km2, the catchment area of the Budhi Gandaki HPP is characterized by a large range of elevation, from green hills in the south to snow covered Himalayan peaks in the north. The mean annual rainfall is 1,495 mm with a high spatial variability while the mean annual discharge at the dam site was estimated to be 222 m3/s. It implies that the mean annual flow of the river at dam site is about 7.0 billion m3 (Figure 2). The 10,000 years flood was estimated to be about 6,260m3/s and the Probable Maximum Flood (PMF) was about 9,800 m3/s (See Appendix 1: Salient Features of the Project for details). Glacial lake outburst flood (GLOF) and landslide dam outburst flood (LDOF) were estimated but the corresponding peak discharges at the dam site were significantly less than the PMF and are therefore not governing values for the design of the dam and spillway structures. 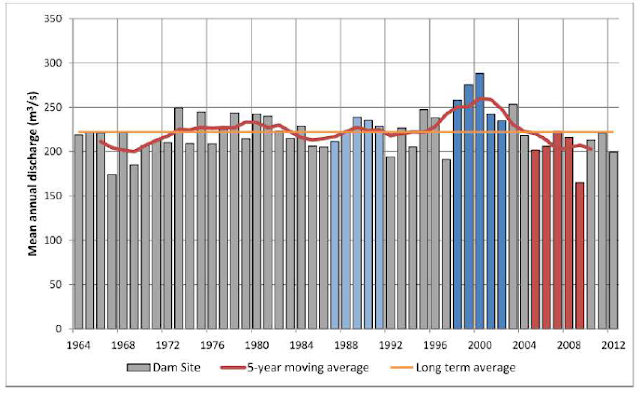 A sediment rating curve (sediment discharge vs. river discharge) based on a 3-year sediment sampling programme was applied to long term river discharge (1964-2012) and was used to estimate mean annual sediment inflow to the Budhi Gandaki reservoir. Almost 600 measurements of suspended sediment concentration and river discharge were used in the development of the relationships for the high flow and low flow seasons. Sediment inflow to the Budhi Gandaki reservoir was estimated to be 7.6±2.2 million m3/year. The volume of sediment due to rare catastrophic events such as LDOF or GLOF was estimated to be about 2 million m3 for an extreme event. The upper limit of estimated sediment inflow equal to 9.8 million m3/year is therefore considered as the annual sediment inflow to the Budhi Gandaki reservoir. Of this amount an estimated 9.6 million m3 of sediment per year (458 million m3 after 50 years) will be deposited in the reservoir without a sediment management strategy. The empirical USBR method, based on observations in existing reservoirs, was used to estimate the deposition patterns in the Budhi Gandaki reservoir. The sediment elevation estimated by this method (depth at which no reservoir capacity is available) after 50 years is 377 masl i.e. 85m below the power intake invert level which is at 462 masl. Sediment deposition will occur in both the dead and the active storages of the reservoir, however the results of the sedimentation study indicate that only about 7% of the active storage will be lost after 50 years and about 13% of the active storage will be lost after 100 years. These values are equivalent to Reference Earthquake Magnitude of 8.7 Richter scale that occurs at 8km below the dam. It is noted here that TERI dam of India, which is 260.5 m high, was built for 8.5 Richter scale. The earthquake of 25th April 2015 of magnitude 7.8 Richter scale was of 0.16g. 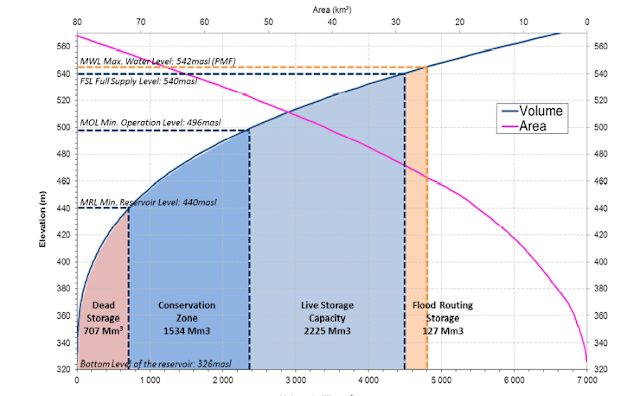 All these figure shows that the dam is quite safe from seismic hazard point of view. The salient features of the reservoir are illustrated in Figure 3 and Figure 4; and given in Appendix 1 too. The reservoir will store about 4.5 billion m3 water at full supply level (FSL) of 540 masl (meter above mean sea level). The minimum operating level (MOL) will be 496 masl. It means the active storage that lies between FSL and MOL will be 2.2 billion m3. 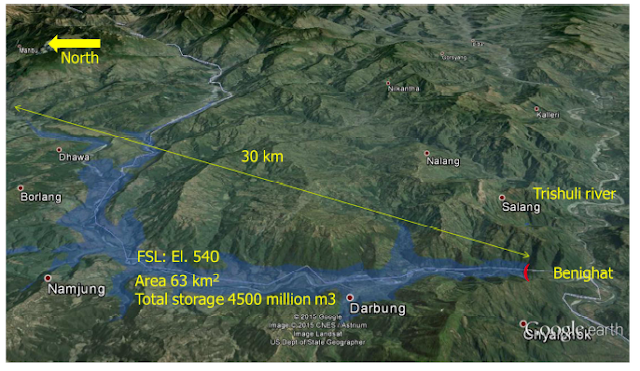 The surface area of the reservoir at FSL will be 63 km² which is about 15 times larger than the Phewa Lake of Pokhara. The dam of this project will be double curvature arch dam as shown in Figure 5. The maximum height of the dam will be 263 m with crest length of 760 m. The width of the dam at the base will be 80m while the width at crest will be of 15m. Total concrete required to construct this dam is about 5.75 million m3. 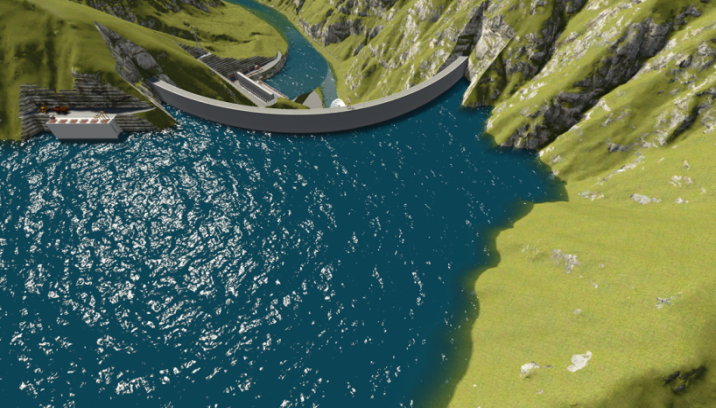 The Budhi Gandaki project has been design and optimized to produce peak energy. The energy production, the firm power capacity and energy availability during the dry season has been maximised in order to compensate for the reduced capacity and/or energy outputs of the other run off river plants of Nepal. For this purpose the Budhi Gandaki project is associated with a large reservoir able to store the monsoon flows and to release a regulated discharge in the dry season. 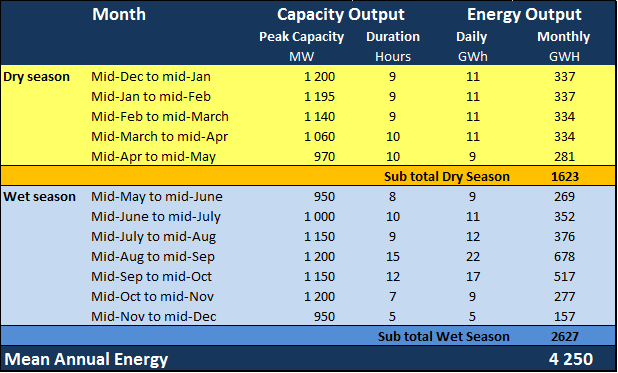 Since priority is given to peak power production, the waterways and the power plant have been sized to concentrate the production during the peak demand hours (Table 1) of the Nepal interconnected network. During low demand hours in the dry season, the Budhi Gandaki Hydropower Project will be on standby mode. The turbine used in this project is Francis type. There will be 6 number of units with rated net head of 200 m. With rated discharge of 672 m3/s, the plant can generate 1200 MW of electricity. The mean annual energy generation by the plant will be 4250 GWh. It will generate 1623 GWh during the 5 months of dry season i.e. from Mansir to Baishak. It gives the plant factor of about 40% which is a quite good figure when we compare with other projects in the world. Some parts of 27 village development committees (Gorkha: 14 and Dhading:13) fall under water (63 km2). It results in total displacement of 3,560 households (Physical and economic displacement) with a population of 20,260. The other 4557 household are economically displaced. It accounts the population of 25,351. Thus the total number of household affected and the number of people affected by the project will be respectively 8117 and 45,611. The estimated total cost of the project is Rs. 260 billion. The duration of construction is about six and half years. The salient feature of the project is given in the Appendix 1. The project area is not only centrally located but also 1776 km Mid-Hill Highway linking 24 hilly districts and major emerging cities is passing through the site. The project is in close proximity to another highway joining China and India. Further the Budhigandaki reservoir is going to be about 15 times greater than the Pokhara’s Phewa Lake. These features have provided a lot of opportunities of development of different sectors. 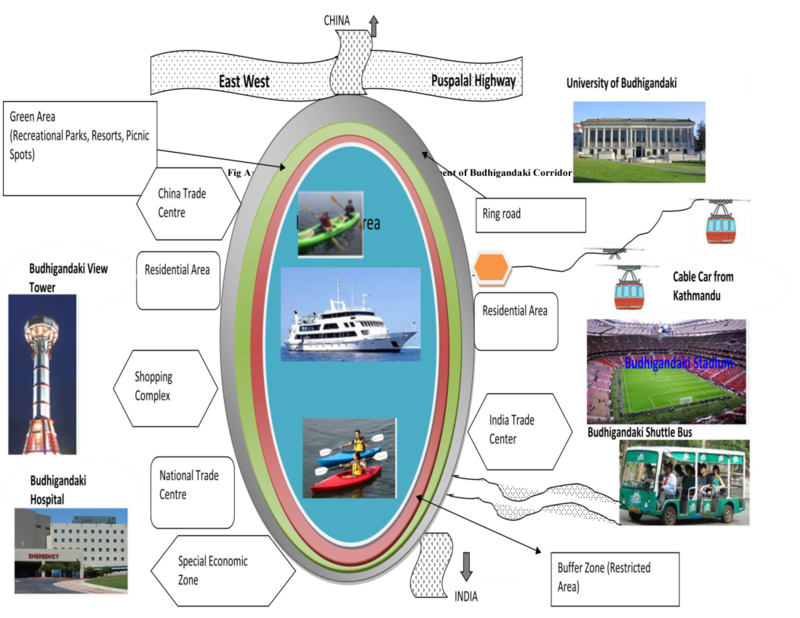 Tourism and modern settlement development around the proposed ring road, establishment of different trade centers: national and international and various shopping complexes with one complex for one product are some of them to name (please see the schematic diagram for the possible development given in Appendix 2). Budhigandaki corridor is, thus, becoming an Economic Hub of Nepal after the completion of Budhigandaki Hydroelectric Project.